About fifteen inches long. Sharp contrasting black and white. Black crown, face, neck and back. White patch behind each eye and white underside. 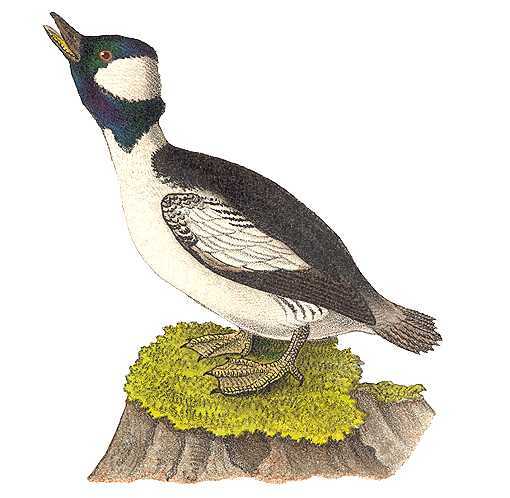 Buffleheads breed in the northern regions – Alaska, across Canada to the lower Hudson Bay Region and Quebec; the furthest south being in the mountainous regions of Wyoming and Northern California. Winters in Alaska, British Columbia, across southern Canada, throughout the U.S. and south to Mexico, and the Caribbean. Another goldeneye, the bufflehead dives with ease, easily overtaking fish. Also eats crustaceans, insects and aquatic plants. It has a thick fatty layer, giving it one of its nicknames, “butter ball”, and tolerates cold weather well until ice blocks it from its food forcing it to fly south in small flocks. Builds a thick cushion of feathers and down often in aspen and poplar tree cavities bored out, used and abandoned by flickers or in decaying tree and stump hollows near ponds and streams. Females lay six to fourteen ivory or olive white eggs, which hatch after about one month of incubation. Parents lead ducklings to water at a very young age and they fly at about two months age. The Bufflehead Nest Box has a 7″ by 7″ floor, 16″ inside floor to ceiling, 2 7/8″ diameter entrance hole located 14″ above the floor (to the top of the hole) and ventilation openings in the floor and under the roof. 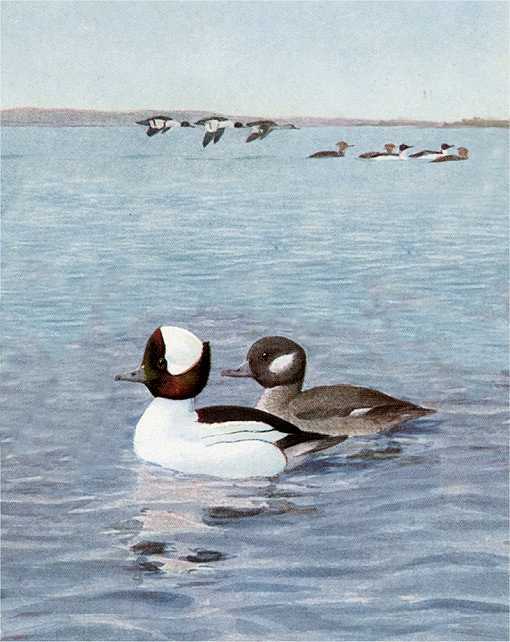 Buffleheads breed in the northern regions – Alaska, across Canada to the lower Hudson Bay Region and Quebec; the furthest south being in the mountainous regions of Wyoming and Northern California. Winters in Alaska, British Columbia, across southern Canada, throughout the U.S. and south to Mexico, and the Caribbean.